The Heil SB-2 Mic Boom is perfect for interview microphone positions or small spaces that the larger PL2T doesn't fit in well. The wizards at Heil have done it again by responding to numerous requests for a high quality short boom that would interchange will all of the Heil brass insert mounts. The stem of the SB-2 is nylon which gives you the smoothest movement of all booms....nylon into brass! The nylon stem of the SB-2 is removable and the Heil SB-2 will screw onto a standard 5/8 inch -27 threaded microphone stand. A cable management clip is molded to the side of the SB-2 to handle your microphone cable. The SB-2 is shipped to you with a 'stealth' C Clamp using an exclusive brass insert. Heil also offers an optional RS1 Riser, FL2 Flange Mount and DT-1 desk top flush mount. 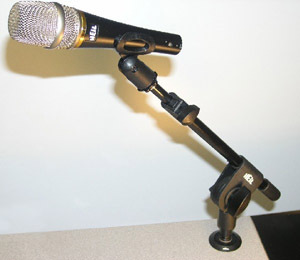 (The microphone and DT-1 desk top flush mount, shown above, are not included).